In 1970, I was in charge of the rating IOR. I represented, during a little while, France beside the ORC (Offshore Rating Council), international organizer for the offshore races. In this time the ORC administered the problems of offshore safety and the rating IOR . the boats became more and more complicated, expensive, and nevertheless neither more maritime nor more effective. I wished to develop monotypes. 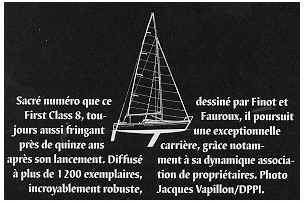 I was associated with J. Fauroux and Bénéteau to develop a new French monotype in the category of 8 metres. 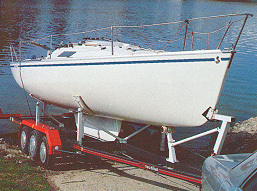 The boat had a good success at once because from the first year we sold more boats than it had been built of quarter ton cup since the origin. At first, we wanted to make a complete boat which can race but also which can take the family for outings, as a day-boat. This compromise has advantages: not giving an image of speed racing boat difficulty useful in family. But the operations in crew is sometimes a little more complicated and less practical because of the benches of cockpit. The boat had a continuous and regular development during more than twelve years, near 1000 boats were built. - Speed, it has a very long flotting waterline . It also has a great prismatic coefficient. 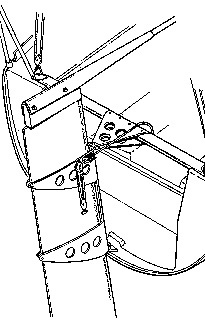 The ballast is a raisable keel which comes to fit in a centreboard box in the boat. We resumed the principle that we had invented for first 22. 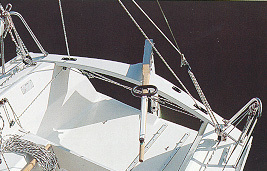 This keel is held by an axis, two bearings on each side and a jack. 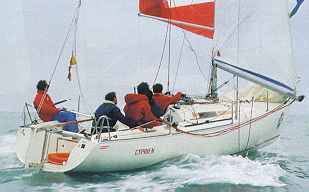 A 7/8 th rigging with two runners. The relatively moderate foresail and the great Main sail allows a better adaptation of the sails to the variations of the wind. The rudder is raisable. The boat is carried by the hull and by the beam at stern. The beam, at first in aluminum, was fabricated then in laminate. In the cockpit all the operations return. This First Class 8, what an old devil, always so dashing, 15 years after the launch!